This Aztec cross stitch design was inspired by the carvings and culture created by a group of people native to Mexico in the 14th-16th centuries. The design features depictions of some Aztec Gods, including Tonatiuh (God of the Sun) on the left, Mixcoatl (God of Hunting) on the right, and Xipe Totec (God of Spring) in the bottom section. The top section has a representation of the face seen in the centre of the Aztec Calendar Stone and Glyphs from the stone feature in each of the four corners of this design (top left - reeds, top right - monkey, bottom left - wind, bottom right - flower). A colourful addition to any cross stitch collection. Only whole cross stitch and some backstitch is required in this design. 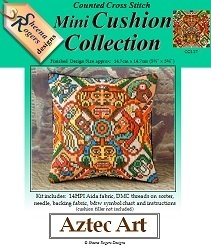 This Aztec themed mini cushion cross stitch kit includes: 14HPI white aida, ready-sorted DMC stranded cotton threads on card sorter, needle, black velvet backing fabric, b&w symbol chart and instructions (cushion filler not included).